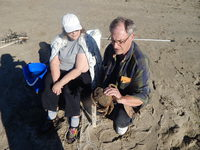 The crabbing report: Our last crabbing clinic saw 2 legal sized Dungeness crabs taken by our class participants. Consider that out of over a hundred participants taking part in 7 Crab Clinics only 1 crabber in the above photo managed to take 2 crabs. Crabbing in the bay has been so unproductive over the last 3 years that I no longer crab in Siletz Bay. We have often speculated that the poor crabbing was the result of the emergence or expansion of a DEAD ZONE. The discharging of treated effluent from inadequate class 'B' sewage processing plants is a major contributing factor to the development and expansion of DEAD ZONES. The poor crabbing challenges the veracity of ODFW's lack of an actual crab management plan. Everything ODFW does is designed to facilitate their philosophy in practices of selling Oregon's wildlife at any price!! !